We are your outsourced transportation service for the ultimate professional impression. 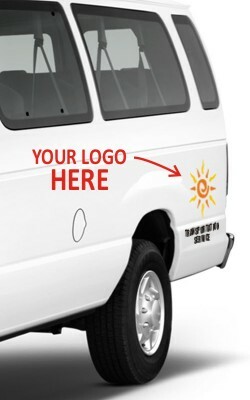 Imagine your guests being received by a driver who presents themself as your business' designated driver for the party during their stay in South Florida, arriving promptly at the scheduled pick up time in a passenger van with your company's name and logo on the side, and wearing a custom embroidered shirt with your company's name and logo. This first impression is one that is usually very welcome, because after the stress of travel, knowing the person is official with your company sets people at ease that they are in the right hands. Upon welcoming them into the vehicle, the driver says "According to your schedule, you will be with us until Thursday, is that right? "; "So you know, the weather will be partly cloudy with a high of 90 and a low of 75, and it may rain a little on Wednesday, but it looks like overall you will have a great stay. There is an activity in the convention center past your hotel the next couple of days, so we may have a little more traffic than usual in the morning. It is a good idea to set our schedule 10 minutes early to offset it, so you can make your meetings on time". As your guests ride in the clean, comfortable shuttle, the driver points out some interesting iconic features and talks a little about the beautiful history behind the areas of the city as the group drives past, tying your company's history into the setting by mentioning, "the company began operations in 1995 (or the date you began operations), in those days, this entire area you see here was primarily cow pastures and swamp land. Most of what you are seeing out the window was built after the company began. This community considers it a part of its history you know." At the drop-off point, the driver helps them unload their baggage and politely confirms the next transportation appointment, and wishes them all the best. That is the group's first impression. And immediately after delivery, the driver calls you as the sponsor, to let you know that your guests are in, that everything went well, and that the next scheduled service was confirmed by your guests. Our aim is further than just doing a good job with our transportation. It is to become your partner. Outsourcing your business personnel logistics through our customized business transportation program provides powerful support to your business' growth efforts. Our drivers are experts on the history behind the sights of the area, due to our training for our sightseeing tours of South Florida. With some background of your company, we can fluidly blend the commonalities of your company and the city, to create an experience that is not only unique, it highlights your company as a significant part of the community of South Florida. It not only enriches your guests experience by providing depth to the sights, creating a great first impression, but above that, it creates a sense of your company's belonging in the area, success, and stability into the future. The driver's knowledge of your company, and the official nature of the transportation solidifies your capability, and strength. Guests often literally feel as though the vehicle was your property, and the driver was your direct employee. And for clarity's sake, we aren't pretending anything. We know we are a separate company, and that is not a secret, but we are in fact hired by you as your authorized and official transportation partner. And that designation makes us a part of your team indeed, and further, we are proud of that fact. Whether your guests are coming for a facility tour, or a training session, or you are simply taking your group on an outing for team building purposes, and whether they are customers, employees, suppliers, partners, investors, or any other person you feel is important to engage positively on your company's behalf, we contribute to make the event that much more powerful. We understand that your success comes from the supportive engagement of the people you do business with, and our customized service is geared to help you set the positive tone you need for an amazing visit, early on. The process is very easy too. You provide us your company artwork and slogan, and some introduction material on your company, mail us a custom embroidered shirt and/or hat, and book your service dates providing the required passenger information, and payment for the non-refundable set-up and deposit for confirmation, and that's it. We take care of the rest. We send you proofs of the artwork, and with your approval, print magnetic labels to the right specs for the designated vehicle(s) for your needs. We develop at least 5 points of commonality with the sights along your route, and the day of the service, our driver wears the shirt, afixes your logos, and picks up and drops off your guests with a completely customized feel that is perfectly transparent to your guests. The price for the two magnetic labels required (one on each side of the vehicle) is $150.00 per vehicle, and the lead time is about two weeks before they are available. Rush service is available, but the set up cost increases. The embroidered garments must also be sent to arrive about a week or two in advance, to ensure everything is ready. It may seem like it requires some work, but the benefits far outweigh the effort. A really great feature of this program, is that after a first service, you can schedule additional services for your guests with no additional set-up costs. Just call or book your reservation online, and we simply re-use the same garments and magnetic labels. Spreading the cost of the set-up over multiple transportation services, at our highly competitive rates, means that you could enjoy, our high service-level, clean vehicles, punctuality, and our customized transportation with your name, and perhaps even save money compared to the alternatives. Start your set up now! Transportation rates are the same standard rates for private shuttle use. Just add a comment that you wish the customized transportation service when you book your transportation, and we will work out the details with you.